This cue is a collaboration between McDermott Cues of Green Bay, WI and PoolDawg.com. It features a maple forearm, multi-wood rings, and a laser engraved Frank the Dawg design at the bottom. 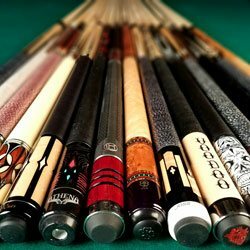 This cue is a collaboration between McDermott Cues and PoolDawg.com. It features a red-stained maple forearm, multi-wood rings, and a laser engraved Frank the Dawg design at the bottom.